Game description: Driver: Parallel Lines is the fourth installment in the cinematic driver-for-hire series from Atari. You can play as an 18-year-old who is the most sought after driver in New York. The twist-filled storyline leads you through 40 missions and 80 drivable vehicles. Driver: Parallel Lines features more realistic damage modeling and improved city detail than its predecessors. You can go online and play against up to seven other players in a variety of multiplayer modes. Diverging from previous Driver games, Parallel Lines takes place in just one city, New York, instead of multiple cities. This game takes place in two time periods; 1978 and 2006. 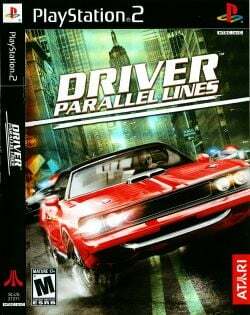 Due to the underwhelming performance of DRIV3R, particularly the often-derided on-foot sections, Parallel Lines returns to the formula used in earlier games in the series, focusing on driving, although shooting still remains in the game. This is the first game of the Driver series that does not follow the series' undercover cop John Tanner. USA v02.20(10/02/2006), Textures issues in hardware mode,Software mode its fine. This page was last edited on 27 December 2018, at 19:56.